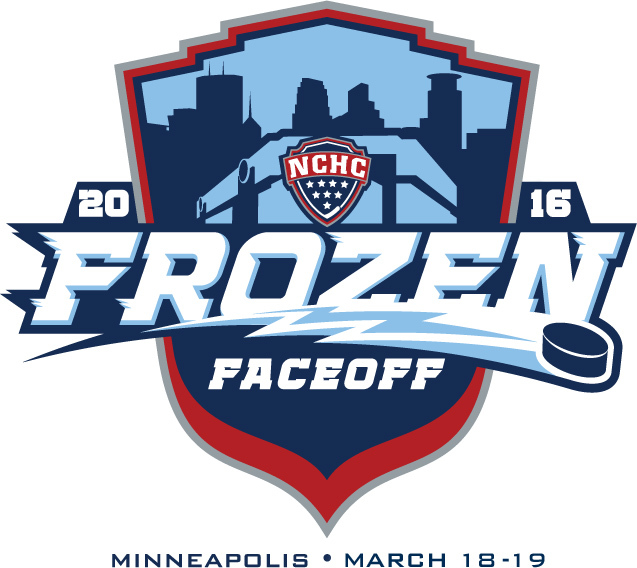 NCHC Playoffs -- First Round: Cliche Alert! "It's Tough to End Somebody's Season"
It's been over six months since the UND men's hockey team kicked off its 2015-16 campaign with a new head coach, new starting goaltender and 11 freshmen. Twenty-eight wins, including 11 sweeps, a conference scoring title by one of those 11 freshman, Brock Boeser and a Penrose Cup title later, the Green and White are right back where they started the National Collegiate Hockey Conference playoffs the past two seasons -- at home facing the Colorado College Tigers in a best-of-three series with a chance to move on to the Frozen Faceoff in Minneapolis. It's been quite a ride for UND and despite what happens this weekend in Grand Forks, the Green and White will definitely be playing in the NCAA tournament in two weeks. For Colorado College, the stakes are much different. It's win or play golf for the Tigers as they are well out of the Pairwise rankings. North Dakota took 11 of 12 points from the Tigers this season, but the old cliche "it's tough to end somebody's season" holds true in this one. While UND's season isn't in jeopardy of ending this weekend, the Green and White certainly have a lot to play for. regular season en route to the opportunity to hang green banner No. 8 in the REA rafters. That push begins tonight. Here's what to watch in this week's "Who? What? How?" NCHC playoffs preview as UND looks to end CC's year in the first round, for the third-straight season. Who will survive and advance? It's time to lace 'em up. It's playoff time. Who will advance to the Frozen Faceoff? Sr. F, Hunter Fejes, 13 goals, 9 assists -- 22 points; Jr. F, Luc Gerdes, 7g, 11a -- 18 pts; Fr. F, Trey Bradley, 9g, 7a -- 16 pts; Sr. F, Cody Bradley, 7g, 8a -- 15 pts; So. D, Teemu Kivihalme, 3g, 12a -- 15 pts; Fr. G., Jacob Nehama, 6-17-0, 3.62 goals against average, .902 save percentage; Jr. G., Tyler Marble, 0-9-1, 3.66 GAA, .892 SV PCT. ; Jr. G. Derek Schatzer got his first career start last Saturday and allowed nine goals to SCSU. Fr. F, Brock Boeser, 25g (Most goals in NCHC, 2nd in NCAA in rookie goals, T-4 overall in NCAA), 18a -- 43 pts (NCHC scoring champ, 2nd in NCAA in rookie scoring, T-10 overall); Sr. F, Drake Caggiula, 18g, 21a -- 39 pts; So. F, Nick Schmaltz, 5g, 29a (T-2nd in NCAA in assists per game with 1.00) -- 34 pts; Jr. D, Troy Stecher, 7g, 18a -- 25 pts; So. F, Austin Poganski, 8g, 13a -- 21 pts; So. D, Tucker Poolman, 4g, 17a -- 21 pts; So. G, Cam Johnson, 18-3-1 (1st in NCAA in win percentage), 1.63 GAA (2nd in NCAA), .937 SV PCT (3rd in NCAA), 5 shutouts (T-6 in NCAA). won the NCHC scoring title. first rookie to earn a league scoring title. The Green and White landed four players on all-NCHC teams. Freshman Brock Boeser and senior Drake Caggiula were first-team selections while junior Troy Stecher and sophomore Cam Johnson earned second-team honors. Boeser was the top vote getter for the all-rookie team. Junior Paul LaDue and sophomore Nick Schmaltz were honorable mentions. UND is allowing just 1.86 goals per game which slates them third in the NCAA. North Dakota has the nation's 8th best scoring offense with a 3.53 average. 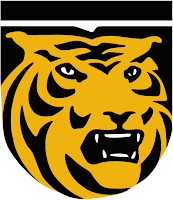 Colorado College is 55th in the NCAA in goals per game with 2.03 and 56th in the country in goals allowed at 3.91. 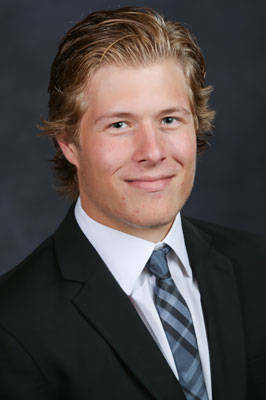 Boeser became UND's first freshman in team history to win a conference scoring title. Boeser's 20 goals and 35 points in conference play earned him the league's best mark in both categories. Both were new conference records. UND senior Drake Caggiula is tied for first in the NCAA with a +34. Sophomore Nick Schmaltz and Boeser are tied for fourth with a +30. North Dakota has the country's 6th-best penalty kill at 86.8%. CC's power play is clicking at 15.6%, 39th in the NCAA. The Green and White are 21-0-2 when leading after 2 periods this season and has not lost when leading after two in more than two years. No. 2 UND (No. 1 in PWR, 28-5-3, 19-4-1-1 -- 59 points, No. 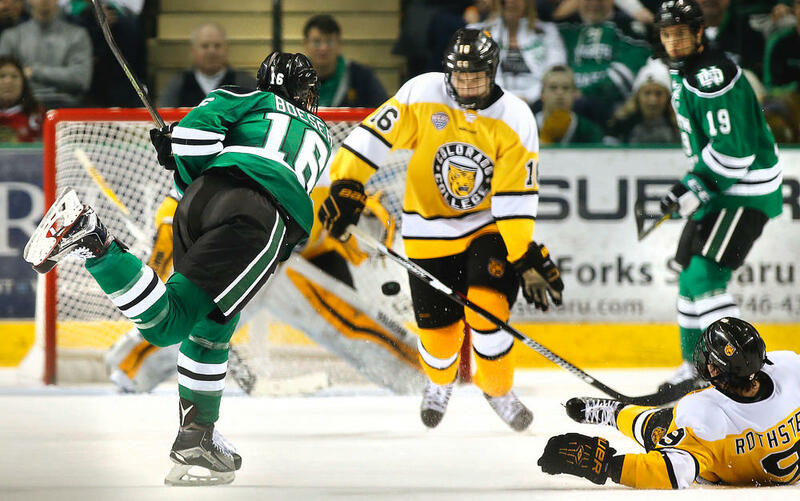 1 seed in NCHC tournament, Penrose Cup champions) swept Western Michigan 8-1, 5-4 in Grand Forks. The Green and White enter the playoffs on a six-game winning streak, the program's longest streak to end a regular season since 2009-10. Colorado College (6-27-1, 4-19-1 -- 13 pts, 8th seed in NCHC tournament) was swept at home against St. Cloud State, 5-2, 9-3. North Dakota took 11 out of 12 points from the Tigers this season, sweeping CC 5-2, 2-0 in Colorado Springs and adding a 5-5 tie (UND won the SO) and 5-1 win in Grand Forks. These two teams have now faced each other in the first round of the NCHC playoffs in all three league tournaments. "You gotta play it one game at a time." "Throw the records out the window, it's playoff time." "It's going to take a full, sixty-minute effort." Part of the reason sports fans love cliches is that they give everyone hope. After all the ups and downs of a season, the wins, the losses, the highlights and lowlights, all that's in the past really doesn't matter. If a team doesn't get it done come playoff time, all the regular season is is a memory. Colorado College is holding the adage "it's tough to end somebody's season" tight as they look to continue their campaign. Outside of a 5-5 tie that saw UND cough up a 4-0 lead at home, the Green and White have wholly dominated the Tigers this season. In the 5-5 tie in Grand Forks, CC's top line of Hunter Fejes, Sam Rothstein and Luc Gerdes pasted UND as the Green and White struggled defensively. As they often do come playoff time, injuries could play a big role in this series. UND looks like it will have the services of dynamic forward Nick Schmaltz this weekend, while the Tigers don't yet have the answer of who will play in net. CC junior third-string netminder Derek Shatzer was forced into his first-career start last weekend against SCSU as Tyler Marble and Jacob Nehama both sat with injuries. 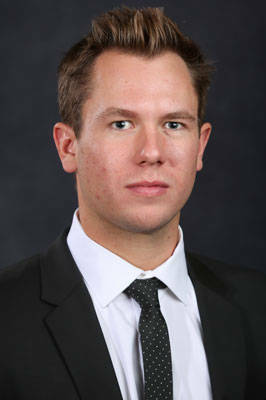 Shatzer was welcomed into college hockey by nine goals from the Huskies. No official word has come as to the availability of Marble or Nehama for this weekend. Rothstein also sat out due to injury. Not having Rothstein would be an obvious blow to the Tigers. UND will be playing a desperate CC squad that doesn't want to see their season come to an end, but the Green and White are simply the better team. If North Dakota can keep the momentum on their side, potting a couple early goals, they should coast. CC is the No. 8 seed and playing for their season for a reason. It's the last time UND seniors Drake Caggiula, Bryn Chyzyk, Coltyn Sanderson and Colten St. Clair will skate in front of their home crowd and DCC thinks their leadership will pace a North Dakota series victory this weekend. North Dakota's big offensive guns and third best defense in the NCAA will be too much for the Tigers. UND SENDS CC TO THE GOLF COURSE AND MOVES ON TO THE FROZEN FACEOFF, 5-1, 4-2. There you have it. Check back after the series to see who punched their ticket to the Target Center. Labels: Brock Boeser, Colorado College, Derek Shatzer, Friday Gameday, Frozen Faceoff, Hunter Fejes, Jacob Nehama, NCHC, Nick Schmaltz, Sam Rothstein, Tyler Marble, UND men's hockey, Who? What? How? No. 4 Minnesota Duluth vs. No. 5 Miami. The UND men's hockey team clinched a share of the Penrose Cup with a sweep of Nebraska Omaha last weekend, but after the series, the team made it very clear that a share wasn't enough. Needing just one point against Western Michigan to become National Collegiate Hockey Conference champions outright, the Green and White wasted no time at the Ralph this past weekend. UND rolled the Broncos for the entire 60 minute affair, winning in 8-1 fashion on Friday to clinch the Penrose all alone, for the second straight season. The Green and White paraded the Cup around the Ralph in celebration. With the trophy in hand, UND struggled a bit on Saturday to find the same scoring touch, but battled back from a 3-1 deficit in the first period to a 5-4 win and a sweep in their last regular season series of the season, their 11th sweep of the year. The CBS line ripped the Broncos on the weekend, tallying 13 points in the series. Brock Boeser's six-point weekend (3 goals, 3 assists) led the freshman to the NCHC scoring title, the first for a rookie in UND history. Here's what stood out to DDC in UND's sweep of WMU in his last regular season Roses and Thorns column of the season. As the regular season closed, the CBS regained its form against Western Michigan. The line of Drake Caggiula, Nick Schmaltz and Brock Boeser were incredible this weekend. Schmaltz's highlight reel goal that made it to No. 3 on SportsCenter's Top 10 was the lead, but the CBS didn't stop there. Boeser flashed his scoring touch here at :10 and at :55. Senior Caggiula also chipped in during his final regular season game for UND at 4:21 in this video, this time sniping the game-winner on Saturday to pace a dominant weekend for UND's top line. Boeser took the NCHC scoring title with a tremendous weekend, the first for a UND freshman. This line stirs the drink for the Green and White and with the playoffs kicking off this coming weekend, UND looks for more of the same as the skate for No. 8 starts. UND's 5-4 win, holding back tears. your head. . . special place." Senior night started off a bit rocky as WMU scored three goals on their first four shots of the game leading to starting goaltender Cam Johnson getting pulled in favor of Matt Hyrnkiw, stunning the REA crowd. Trailing 3-1 after the first period, Bryn Chyzyk entered the locker room and let the team know that it wasn't going to end like this. "Screw senior night," alternate captain Chyzyk told his teammates. "We need to win." In the second with Hyrnkiw in the net, Chyzyk responded accordingly, netting a short-handed goal to spark the comeback 5-4 win. Caggiula scored the game winner early in the third. It was a great weekend for the four as Sanderson chipped in two goals on Friday and St. Clair entered the lineup on Saturday after sitting out the night before. After the Saturday night win, the group watched their tribute video and emotions ran high. "Extremely emotional," Caggiula said of his final regular season home game. "It just exceeded everything I thought it could be. Even during the game, there were lots of ups and downs. Then, obviously, with it being senior night. . . it's pretty emotional seeing my mom cry before the game, so I've got to put a little on her. It's emotional but it's a special one." The group of seniors get one more go of it at the REA, in the first round of the NCHC playoffs this weekend against Colorado College. UND netted 13 goals on the weekend, including eight on Friday in their highest output of the season. While the CBS line certainly did their part, the Green and White got plenty of secondary scoring against the Broncos. UND's fourth line scored four times on Friday, two each by Sanderson and freshman Chris Wilkie. Chyzyk, freshman Shane Gersich and juniors Paul LaDue and Troy Stecher rounded out the secondary scoring on Saturday. Eight goals from non-CBS players is a big deal for this team. Wilkie looked sharp on Friday and getting goals from the freshman who tied for the lead the USHL scoring title last year, is huge for UND going into the playoffs. 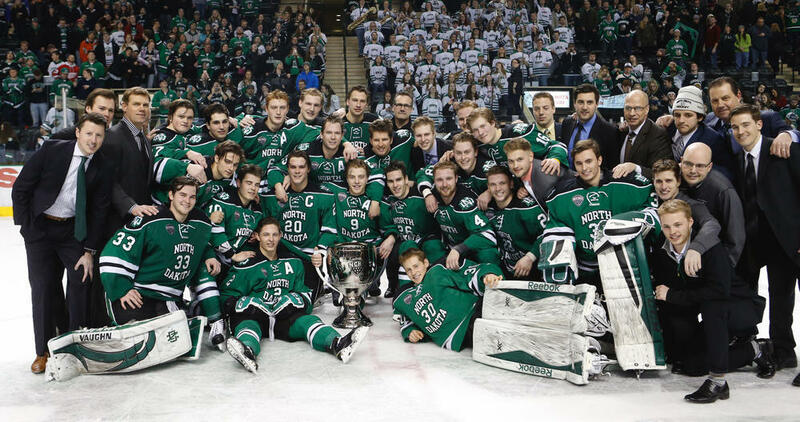 UND gathered with the Penrose Cup after a 8-1 win on Friday night that clinched the NCHC regular season title outright. *Sigh*.... Oh the lovely injury bug makes another appearance in the Thorns section. After a dynamite, four-point night (1g, 3a) on Friday, freshman Nick Schmaltz did not play on Saturday despite skating in warm ups. Schmaltz, who was nicked up in the third on Friday, left the ice and was replaced by Joel Janatuinen, who UND head coach Brad Berry had to call from the dorms to hurry into the lineup. Also adding to the injury frustration, captain Gage Ausmus left in the third on Saturday after taking a slapshot to the foot. The junior defenseman rejoined the sqaud for senior send-off, but the injury is still a concerning one for UND. Schmaltz and Ausmus are two key cogs for the Green and White and their status will be something to watch as UND prepares for the NCHC playoffs. What a weekend. It's time to strap in, folks. The playoffs are here. Come back later this week as DDC previews the first round of the NCHC playoffs.